Government has a ‘Zero Tol­erance Policy’ towards vio­lence against women and children in Fiji. 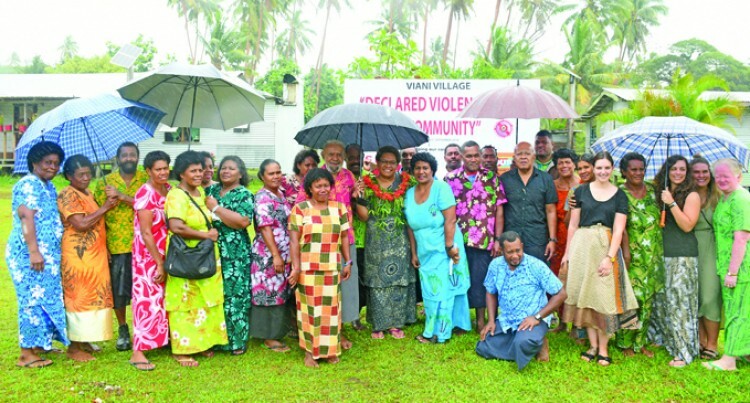 These were the words of the Min­ister for Women, Children and Pov­erty Alleviation, Honourable Mer­eseini Vuniwaqa while officiating at the declaration of Viani Village as a Zero Tolerance Violence Free Community (ZTVFC). Ms Vuniwaqa said the Zero Tol­erance Violence Free Community (ZTVFC) programme, which aims to empower and educate the com­munities in taking action to stop violence in their communities. She said the Government would continue to address the issue of violence against women and the costs it bears to our Government. Viani is one of the nine villages in the district of Navatu in the province of Cakaudrove. The village has a total number of fifty eight households and their main sources of income are fish­ing and farming, and supplemen­tary sources of income includes copra production. In May 2015, Viani was identi­fied as a hotspot area by the Police during an awareness programme at Wailevu District on the topic of Domestic Violence and Child Abuse. The first of the ten phases of trainings under the ZTVFC pro­gramme was conducted in 2015, and the remaining trainings were conducted phase by phase. Viani Women’s Group Secretary, Mrs Akisi Wasevanua, 53, said that the ten phases of training was an eye opener for them and it will help the men and women to know the importance of women’s empower­ment and safety in a community. Viani Village headmen, Mr Pet­ero Biautubukoso, 45, said that all the domestic violence cases will now be reported to the gatekeep­ers and they will work together as a community to eliminate violence against women and children.